One of the most spectacular holiday traditions at Walt Disney World is the transformation of Cinderella Castle into a glittering icy palace. As we've mentioned before, this year Queen Elsa of Arendell takes center stage on a Castle forecourt platform that's been bedecked in garlands, ribbons and bows. She uses her frozen fractally powers after dark to turn the iconic Cinderella Castle into a stunning centerpiece for the holidays. 200,000 shimmering white lights dance and play to create this magnificent light show highlighted with snowy projections. 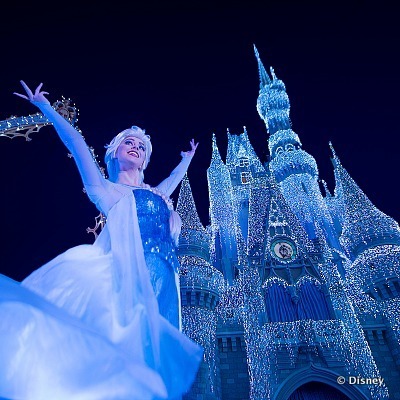 Each night throughout the Holiday Season Magic Kingdom guests are treated to the dramatic celebration and beautiful holiday wish from Queen Elsa, Princess Anna, Kristoff and Olaf. Showtimes are updated nightly, so if you're in the Park be sure to check your entertainment schedule and times guide so you don't miss a moment of the magic. We thought that everyone should get to join in on this wintery fun, so we're sharing with you some fantastic video of the show, shot by our friend John over at BigFatPanda.com. A big thanks to him for being in the Parks this holiday season and creating some fantastic video for the folks back home. His channel is one of my favorites. So - what did you think of the show? Leave a comment down below and share what you loved most. I am not crazy about "Frozen" theme, but I have to admit that Disney did an awesome job on the castle. It was worth watching the whole video just for that. I have several friends with whom I shared it with who are avid fans of the movie and the characters. Again, AWESOME JOB!!! Great video, just wish that they would sung some Frozen songs or holiday Christmas carols! I won't get to see this live this year, but I love the video--much improved over the old show. I'm getting a little bit "frozen'd-out", but this is the perfect venue to give a nod to the film in the parks.